The BRU-55 allows carriage of two smart weapons(up to 1000lb class) on a single aircraft station. BRU-55 weapons currently consist of JSOW, 1000 lb JDAM, and WCMD. The BRU-55 uses the MIL-STD-1760 interface (A/C-to-Rack and Rack-to-Weapons). BRU-55 aircraft currently consist of the F-16 and F/A-18. Future expansion is possible to other MIL-STD-1760 aircraft and weapons. The Smart Rack has two configurations. The BRU-57/A is for use initially by the Air Force on the F-16 and the BRU-55/A is for use by the Navy on the F/A-18. During the Engineering and Manufacturing Development phase, the Air Force configuration was unofficially referred to as the BRU-55A/A. 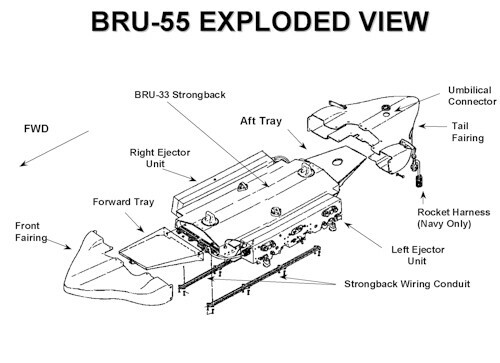 The Air Force's BRU-55A/A consists of the BRU-33 strongback (GFE from the Navy), 2 x BRU-46 ejector units, and electronics (being developed under the EMD contract). The BRU-55 is 70" long, 26" wide, and weighs 240 pounds. Its aircraft interface is 30" lugs and single -1760 umbilical. Its weapons interface is 14" lugs and one -1760 umbilical each. The BRU-55 program is currently in development under an E&MD contract. The initial qualification testing began in January 1998. Flight testing began in August 1998. Source Selection for the BRU-57 Program began on 07 January 1999.